The Global Groove festival is on 19 and 20 December at Tivoli Gar­ dens, New Delhi. Passes are avail­ able for Rs500 (www. globalgroove.in). The Sunburn fes­ tival will be held from 27­29 December at Candolim, Goa. A three­day pass costs Rs3,000 (www.sunburn­festival.com). Electric version: (clockwise from top) Jalebee Cartel playing live in Singapore; Avinash Kumar of Basic Love of Things (B.L.O.T. ); Gaurav Malakar (in the fore­ ground) of Qilla Records. played. You could be playing alongside a tech house artist (an EDM genre that mixes ethereal, ambient sounds with prominent beats) and a DnB person and it would just be called Electronic Night, says Vagale. With the divisions between genres becoming clearer, it would be musical sacrilege to put them together today. It was the arrival of cheap broadband Internet access that catalysed that change. Electronic musicians now had easy access to sounds, inspiration, and the chance to promote their own music online. 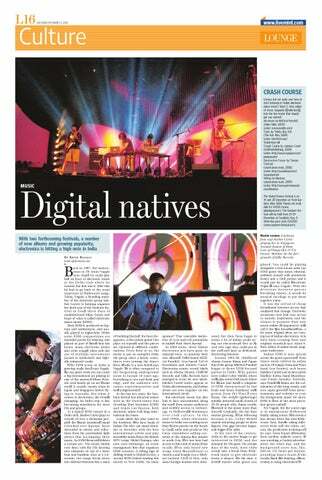 Compared to, let s call it the pre-broadband era, a lot more original ideas are coming out of Indian electronica. 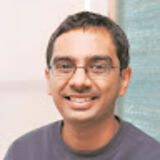 Acts have been creating their own original sounds, says Arjun S. Ravi, editor of online music magazine Indiecision. Indian EDM is now spread across the genre spectrum from trance music (driven by artists such as DJ Sanjay Dutta and Pune band Lost Stories), tech house (Jalebee Cartel) and techno (artist Madhav Kohra, band Bhavishyavani Future Soundz). Festivals, says PunditZ s Raina, are the culmination of this long, steady, and now rapid growth from advertisements and websites to even the background music for news, EDM is one of the most prevalent genres today . For Vagale, the the surest sign is in omnipresent Bollywood finally taking notice. Electronica has always been the anti-Bollywood. Now, they re taking influences from us the remix culture, the production techniques, he says. Faiza found affirmation from another unlikely source. I was watching a Godrej advertisement the other day, and the background score was, like, full-on 135 beats per minute, pounding dance music, she recalls, and I m thinking, c mon, Godrej is using electronica? !